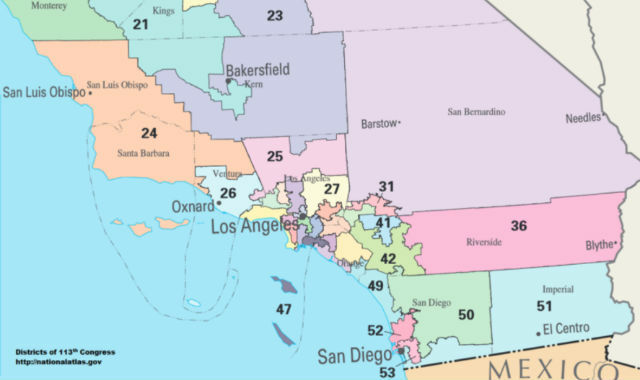 Current Congressional districts in Southern California. One election is a fading memory and another is year away. What better time to prepare for the vote in 2022? That’s what California State Auditor Elaine Howle is doing. Howle’s office must do the spade work necessary to create a new California Citizens Redistricting Commission to draw district lines for legislative, congressional and Board of Equalization seats. And she wants your help. “We’re going to do this as publicly and with as much transparency as we can,” Howell said Thursday. The State Auditor is responsible for ensuring the commission is as independent and reflective of California as possible. The process begins with an introductory town hall at the auditor’s office next Friday at 10 a.m. For details, click here. You can start submitting applications to serve on the commission on June 10. To qualify, you must have been a registered voter for the past five years, and registered in your party of choice—or have been a no-party preference voter—for five years. You must have voted in at least two of the last three state elections, and you can’t have been a campaign donor in recent years. Auditors will winnow down the applications and pick eight commissioners by July 5, 2020. Those eight will pick the final six members. The commission will set about drawing lines for the coming decade, completing the task by Aug. 15, 2021. California voters in 2008 and in 2010 approved initiatives stripping politicians of the power to draw their own district boundaries, and placed it in the hands of the independent commission. Republican donor Charles Munger Jr.took the lead in funding the initiatives, and Gov. Arnold Schwarzenegger, also a Republican, promoted them. Schwarzenegger continues to campaign against gerrymandering nationally, touting California’s model. In California, district lines are not drawn in ways that protect incumbents, unlike in most states where the party in power tweaks district lines to ensure they retain control. In recent years, several California legislative and congressional seats have become competitive. As it happens, Democrats are winning most of the swing seats, but that’s because Republicans are losing registration.